Of all the electric mowers we've tested to date the Greenworks Pro 21" and the Snapper XD are the best. In our head to head competition we gave the Greenworks the top spot because it weighs in at considerably less, which is important in a push mower. Like most GreenWorks creations, the PRO-21 was designed to offer a clean and quiet alternative to mowers that utilize fossil fuel burning engines. Right off the bat it's important to know there are only a few mowers that offer 80V power and above. This much voltage brings them amazingly close to achieving the same power as a gas mower. 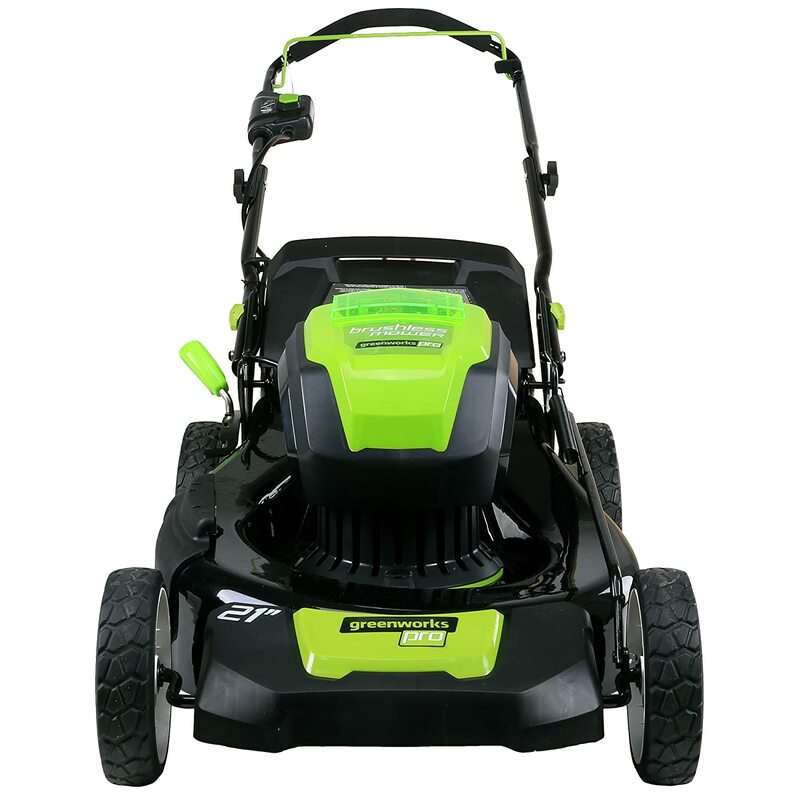 In fact GreenWorks estimates this particular mower will offer performance comparable to a 160cc engine. One of our initial complaints with electric mowers was they often sacrificed build quality and durability to keep costs down. This was done in large part because lithium-ion batteries and brushless motors were expensive. But economy of scales have helped to lower prices on these key components. The PRO-21 doesn't suffer from these issues. It uses a steel deck that is both durable and resistant to wear and tear. Many mowers in this category utilize mostly plastic parts and are susceptible to damage when bumping into things in the yard. It has 10" back wheels which are great for maneuverability and when combined with the relatively light weight of the mower itself, makes working in tighter spaces a snap. The foam on the handle of our unit was a source of frustration as lifting and turning the mower caused it to move and bunch up. A minor complaint, but still annoying. The mower has brushless motor technology which increases its torque. Brushless motors deliver a lot of power without heating itself up and wasting the battery’s energy. This mower’s power is comparable to that of a 160cc gas-powered mower. It has built-in smart cut technology that increases the motor speed when the mower passes over tall or dense grass, and then decreases the speed whenever it passes over shorter or thinner grass. The dynamic power output helps increase runtime by conserving the battery’s charge. If most of your lawn is comprised of tall and dense grass, your mower will keep outputting the maximum amount of power and will drain the battery a lot faster. For many folks a push mower just isn't an option. The self-propelled model of the PRO-21 is a great solution in this situation. At 80lbs this mower is actually HEAVIER than some conventional gas models. But the self-propelled motor makes mowing a snap. It does tend to drain the battery faster but we noticed no significant slowdown when using the self-propelled feature while simultaneously cutting thicker grass. The mower is quite easy to start — most GreenWorks mowers usually are. You just push the start button, pull the bail switch and voila, it’s running. Be sure that the battery is sufficiently charged and inserted into the mower correctly. To close the back handle of the mower, press and hold the green safety lock out button. While holding down the button, pull the bail switch towards the mower’s rear handle. Want to see our choice for the best? Check out our head to head competition between the best electric mowers. Once the mower has started, release the safety lock out button and you’re ready to mow like a madman. Once you’re done mowing, just release the bail and the motor will automatically cease operation. The mower has one rear handle that adjusts all its wheels simultaneously. Having separate adjusters for each wheel can be a pain, so the fact that you only need to worry about one significantly improves the user experience. The mower has seven height settings, the first setting is 1 ¼”, the second is 1 ⅔”, the third is 2”, the fourth is 2 ⅓”, the fifth 2 ¾”, the sixth is 3 1/7”, and finally, the seventh setting is 3 ⅝”. We'd like to see a higher setting than 3 5/8" but this isn't a mower that you're going to want to use on lush, thick grass so lower cutting heights make sense. The mower comes in at 79.5 lbs. It's not a lightweight by any means, though it is 10lbs lighter than our favorite electric mower from Snapper. Still, it maneuvers quite well. Its heavier-than-average weight is a result of the thick steel used to make it. If you choose the self-propelled version you'll never notice the extra weight. Most electric mowers suffer from the same problem in terms of mulching and bagging. The blades generally don't generate as much suction as a gas -powered mower and so you tend to leave more clippings behind. Bagging was the one area where the PRO-21 truly lagged behind the Snapper. The Snapper rarely required two passes to pick up all the grass clippings. That said the PRO-21 allows you to bag your clippings, mulch them, or use the side-discharge feature. When mowing thicker grass we found we had to make multiple passes to ensure we picked up everything while using the bagger. The mulched grass was sufficiently chewed up, and of course the side-discharge worked as expected. 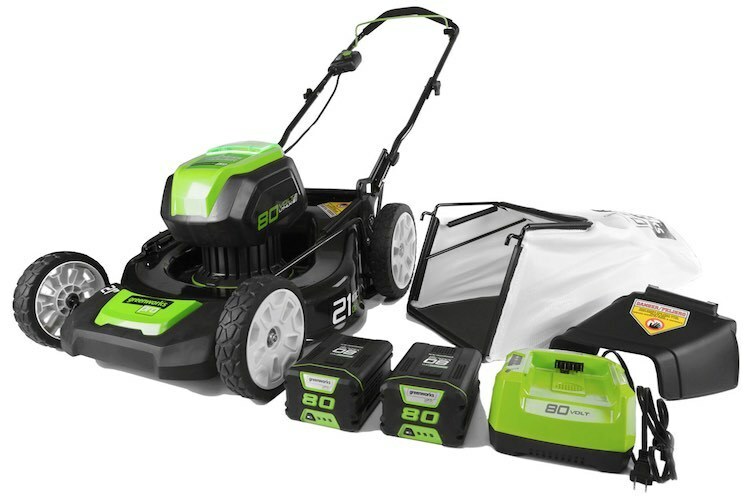 The mower comes with an 80V 5Ah lithium-ion battery and charger. You may also use other chargers from other GreenWorks products to charge the battery. Some of these include the GBA80200, GBA80400, and GCH8040. The battery takes 30 minutes to charge and can power your mower for up to 70 minutes if you only mow low, thin grass. In terms of run-time the Greenworks was LITERALLY neck-and-neck with our favorite the Snapper. Only the Yard Force offers more power. For easy storage, you can turn the handle knobs 90 degrees and lower the handlebar. You have two options as far as storage position goes: horizontally, or vertically and leaning on the handlebars. Storing it in a vertical position saves the most space. It basically takes up the same amount of space as a medium-sized piece of luggage. I will say that folding the handle took a little practice. The first few times it was a hassle, but once you've mastered it you can stow the mower in no-time at all. The mower is surprisingly quiet in spite of its power. You can even listen to music while you mow, and if you leave your doors closed, the mowing can’t be heard from inside the house. As with any mower that is shipped to your doorstep there will be some assembly required. The included instructions were extremely easy to follow and we were able to get the unit put together in well under 30 minutes. The mower has a four-year warranty, and the battery and charger have a two-year warranty. The steel deck is quite durable, but the adjustments at the handle have room for improvement. The plastic clip adjustments are a bit of an eyesore. This mower is a great option for those with yards of 1/2 acre or less. If you're lucky enough to have thinner grass you could probably even get away with 3/4 acre. Our biggest complaint is the suction for the grass clippings. The Snapper offered better performance in this regard, rarely requiring a second pass. We'd also like to see some improvement to the handle as the foam grip too easily gets pushed around during use. It's a solid second choice though.